A family-friendly neighborhood with affordable housing, plenty to do and true walkability, Brookline attracts young families and single professionals looking for an urban environment with suburban amenities. Brookline Boulevard is the main street every neighborhood wants. Restaurant options are many and varied. Craving Mexican? Mexican grocery store Las Palmas Carniceria sells some of the city’s best tacos from their sidewalk stand. In the mood for some lighter Middle Eastern fare? You’ll find plenty at Pitaland, a Brookline staple for nearly fifty years. Or, If you prefer something a little more old school, head to No Name Coffee Shop, a classic hole-in-the-wall diner. Sweet tooth? Brookline has you covered. From the classic Party Cake Shop to ice cream shop Scoops on the Boulevard, finding dessert is never a problem. Head to classic neighborhood hangout Brookline Pub for local drafts, barbecue ribs and killer nightly specials. For a little taste of everything, explore the neighborhood’s culinary scene with ‘Burgh Bits and Bites, which offers walking food tours of Brookline. Though a handful of shops line Brookline Boulevard, the best named is surely the Geekadrome, a quirky comic book shop that also sells games and other pop culture merchandise. Stretch your legs at Moore Park or Brookline Memorial Park, both of which feature recreation centers, athletic fields and playgrounds. Brookline Memorial Park is also the start and end point for the Brookline Breeze, an annual 5K run that has been held in the neighborhood since 1982. Brookline boasts one of the most beautiful branches of the Carnegie Library of Pittsburgh, complete with ample meeting space and plenty of kid-friendly features. The library has been serving the community since 1930. 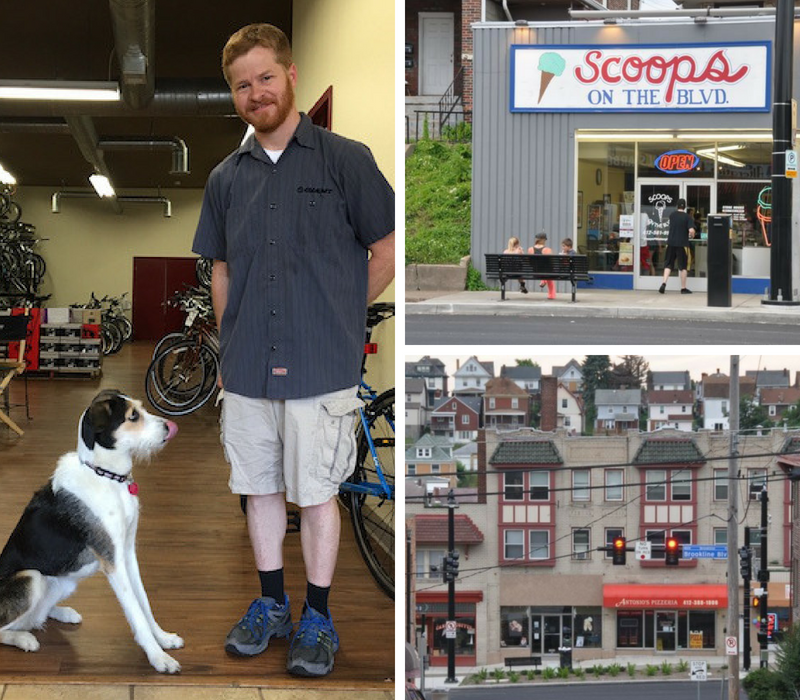 With over 13,000 residents, Brookline is one of the largest of Pittsburgh’s 90 neighborhoods. Even so, the population has declined considerably from its peak, which neared 22,000 in the 1960s. Nearly 100 businesses line the busy main street of Brookline Boulevard. According to the Brookline Connection, early settler Richard Knowlson referred to the land around his farm as Brookline because the rolling hills and streams reminded him of the Massachusetts town. The name caught on. Legendary NFL quarterback Johnny Unitas and with astronaut James Irwin (the eighth man to walk on the man) grew up in Brookline and attended Brookline Elementary School.